In the recent past, Quality Analysts have gained importance across businesses. In fact, there are a number of fields that a quality analyst can pursue, viz. Software development, Manufacturing or Customer Service. 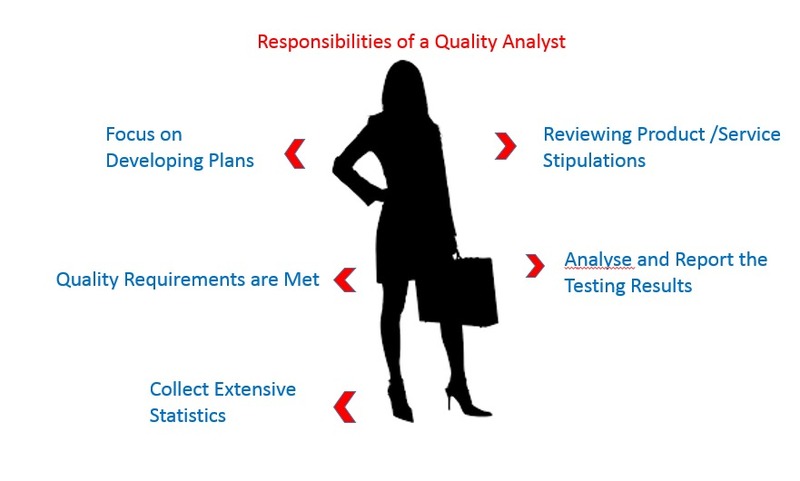 Irrespective of the chosen field, a quality analyst has a number of important responsibilities. One of them is to focus on developing plans, while ensuring that all quality requirements are in compliance with company’s pre-defined norms. For instance, in manufacturing it would be to determine the types of tests that need to be performed or the number of samples to take per lot. In software development, the analyst develops plans and writes test cases to ensure that computer applications meet the specified requirements. And, in the customer service organisation a quality analyst does audit and surveys sample customer service transaction. In a nutshell, the role of an analyst extends to frequently reviewing product and service stipulations. Additionally, improvising these stipulations also becomes a part of their job. Another vital task of a quality analyst is to analyse and report the testing results. Further, the quality analyst has to collect extensive statistics, while being aware of the root cause analysis technique to find the source of defects. Moreover, the responsibilities get more specific depending on the field and organisation you choose. However, one thing that remains common is the basic background. That is, a quality analyst requires higher education, strong analytic skills and most importantly an eye for details. These qualities and much more can be achieved through Welingkar’s Distance Education. Here, you can refine your skills and explore new possibilities in the world of business. This entry was posted in We Learn and tagged quality analyst, Quality Analysts, Responsibilities of a Quality Analyst. Bookmark the permalink.